Pharma Marketing Blog: Pharma Pinterest Update: Bayer US Pins, Novo Nordisk Depins! Pharma Pinterest Update: Bayer US Pins, Novo Nordisk Depins! Novo Nordisk "depinned" (deleted) everything on its Pinterest boards (here). 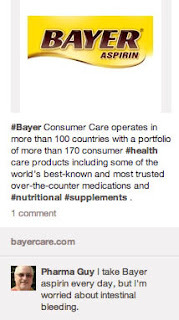 "Bayer has joined up-and-coming social network Pinterest and is using it to share images and information about its activities in the US" (Hat Tip to PMLive: "Bayer starts using Pinterest"). Bayer snapped up the Pinterest username "bayerus" ("bayer" is being used by an individual named "Courtney Bayer"). It currently has three Pinterest boards: (1) Bayer's Business, (2) Sustainability, and (3) Innovation. Twenty-eight items (including at least one video!) are posted to these boards. Bayer has pinned a couple of product images, including this one for Bayer Aspirin (shown on the left; click on it for an enlarged view). As you can see, visitors are able to add comments to these pins. Always the "spoiler," I added a comment that was a truthful concern of mine, but one that points out a possible "adverse event." Aspirin, of course, is an over-the-counter drug not regulated by the FDA like Rx drugs are regulated. Therefore, Bayer does not have to worry about reporting this adverse event to the FDA. But will it allow the comment to stand and/or make a reply? I'll let you know. I have also "repinned" this image to my Pinterest "Pins from Pharmaceutical Companies" board (here). I notice that my comment does not carry over to the "repinned" image, so I added a comment about the comment I made over on the Bayer US Pinterest site. I have found no way to edit or otherwise manage comments on Pinterest. It appears that the only option is to delete the pin and then repin it without the comments. This inability to moderate comments may be Pinterest's Archilles heel as far as pharma is concerned. But as of this date, pharma's presence on Pinterest is virtually unnoticed except for me and a few other pharma social media followers! P.S. As I mentioned, Bayer included at least one video as a pin. I didn't know you could do this. Kudos to Bayer for taking advantage of that capability! "It is important that you speak with your doctor before you begin a daily aspirin regimen, only your doctor can determine if you are an appropriate candidate for aspirin therapy. Please contact us at 800-331-4536 (M-F 9:00AM -5:00PM Eastern Standard Time) we would like to learn more about your use of Bayer Aspirin." At least Bayer responded rather than deleting the pin as I suggested was an option (see above). It's still early in the game for Pinterest as a viable social media site. However, Pinterest is now the 3rd most popular social networking site behind Facebook and Twitter (see here). I think pharma needs to provide support to patients through every channel at its disposal, including social media. When Bayer, for example, suggested I call their phone number (M-F 9:00AM -5:00PM Eastern Standard Time) in response to the comment I made on their Pinterest site, I was surprised they didn't just continue the conversation on Pinterest since that was the channel I used to open the conversation and thus clearly my preferred channel. I'm interested to see how quickly they spot/reply to comments. For what it's worth, Novo Nordisk sells just a few items that aren't OTC, and it's insulin analogues were made Rx only thanks to rival Eli Lilly & Co. who insisted that the FDA make first insulin analogue (Humalog) Rx because all other insulin formulations sold until that point were OTC, and Lilly felt that having an Rx requirement would garner it more attention from doctors. However, the FDA is now reconsidering whether those products be OTC since those are no less safe than the older insulin varieties. Novo's motivation for discontinuing Pinterest apparently has to do with something else. Hi John. Thanks for your continuing interest in the Novo Nordisk Pinterest profile. I'm sorry about the depinning since you mentioned it in your earlier blogpost. I deleted the pins because they weren't really representing how we want to use our Pinterest profile going forward. I had pinned a few things to illustrate the use and functionality of Pinterest to some people inside Novo Nordisk - mistakenly thinking that it could go unnoticed :) - when you pulished your post. We are currently looking into what we can use the profile for and how we can use it. That's all I can say at this point. Thanks for the update. I am still interested in having you as a guest on my BlogTalkRadio show if you also are interested. Let's talk next week sometine.